Chetan Bhagat’s Half Girlfriend – Insight. . . ! Once upon a time, there was a Bihari boy called Madhav. He fell in love with girl called Riya. Madhav didn’t speak English well. Riya did. Madhav wanted a relationship. Riya didn’t. Riya just wanted friendship. Madhav didn’t. Riya suggested a compromise. She agreed to be his half-girlfriend. I’m so sure that this would also conquer Indian readers mind! 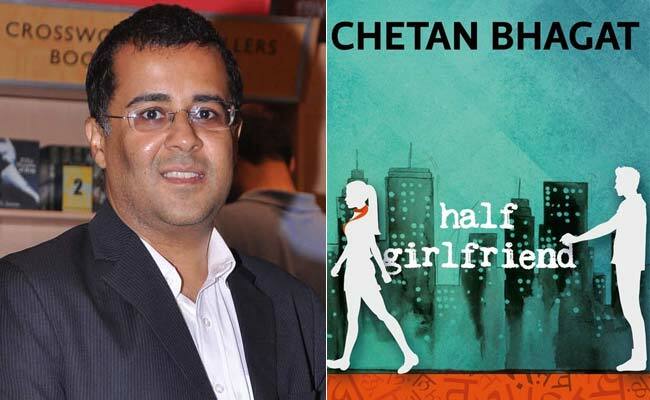 I mean, Half Girlfriend is going to be yet another flimsy- romantic cliche from Chetan Bhagat, who is one among the national bestselling author, which will hit the bookstores by the mid of October during this year. Although I’m a critique reader of Bhagat’s works since I completed reading Revolution 2020, I wouldn’t say that Bhagat’s novels are based on poky- cheesy- fanciful plots like many of his readers say, though he’s conquered many of the teenagers as well as youngsters hearts through his alluring writing style and redundant story plots. As a published writer, if he’s successful in conveying his inner creations to the outer world, at least right in front of this major group, then how could many of us underestimate his newly written novel just after hearing its title before the official launch? Chandigarh is the #HalfGirlfriend of Punjab and Haryana? For Engineering Students even #HalfGirlfriend will work, but which half? That's the question. "5" Point Someone "3" Mistakes of my Life "2" States "1" Night at a Call Centre #HalfGirlfriend Next Book: "¼" Brain ? #HalfGirlfriend is coming tomorrow! when is the other half coming? I would love to know your anticipation on the book too. Feel free to express it without a second thought here. This entry was posted in Book Reviews, Personal thoughts and tagged Books, Chetan Bhagat, Funny, Girlfriend, half girlfriend, India, Indian best selling author, Indian best selling novel, Love, Personal thoughts, reviews, Romance, social media network, Twitter. Bookmark the permalink. Hahaha what a ridiculous title! But the guy is a marketing genius and he definitely anticipated and probably welcomes all the attention the title is getting from the ever-critical Indian audience, that too before the book is even released! Did you know the guy pitched his first book to the publishers using a presentation about how to market it rather than story itself? Same strategy here. His storyline – redundant. His female characters – eye candies. His writing style – mediocre. But yes, he sells. haha. so funny. thoroughly enjoyed reading this post! Thanks for sharing. 🙂 Hows u? I wasn’t around for a long time. back now. See you around! I don’t even know why people read Chetan Bhagath’s books. He is so filmy in his story telling. If you want your story to be a movie, why publish a book ?